In Ireland, it’s easy to take the top‐quality food for granted. We have butter that’s a creamy yellow, the way it should be; bread that’s baked fresh every day and delivered to the stores first thing in the morning; brown eggs that are so fresh they’re often not even refrigerated in the grocery store; lamb that’s world famous; and grass‐fed beef. recently, in which he says that 100% grass‐fed beef commands premium prices in America (and indeed, a recent article in The Village Voice said a 1‐lb grass‐fed, local steak set them back $26 compared to $9.99 for a typical feedlot steak of the same weight). Yet in Ireland, famous for the lush green grass (it’s not called the Emerald Isle for nothing), it’s just the way beef is. As I type this, I can look out my window and see my neighbor’s cattle grazing in the field just across the road. When I cook in my kitchen, I look west over a patchwork quilt of fields of potatoes, wheat, more cows and sheep too. When I take a walk with my son in my rural neighborhood, we pass another neighbor’s dairy farm, and if I walk further still, we pass the lambs that eventually wind up in the local butcher. If I walk east, I can stand at the top of our hill and see the Irish Sea about ten miles away, where small, colorful fishing boats trawl the waters. Compared to the US, where the average food item in a typical meal travels 1,500 miles to reach your plate, I feel very lucky indeed to be able to stand on my front step and practically be able to see where my milk, beef, lamb and fish come from, not to mention potatoes and various grains as well. 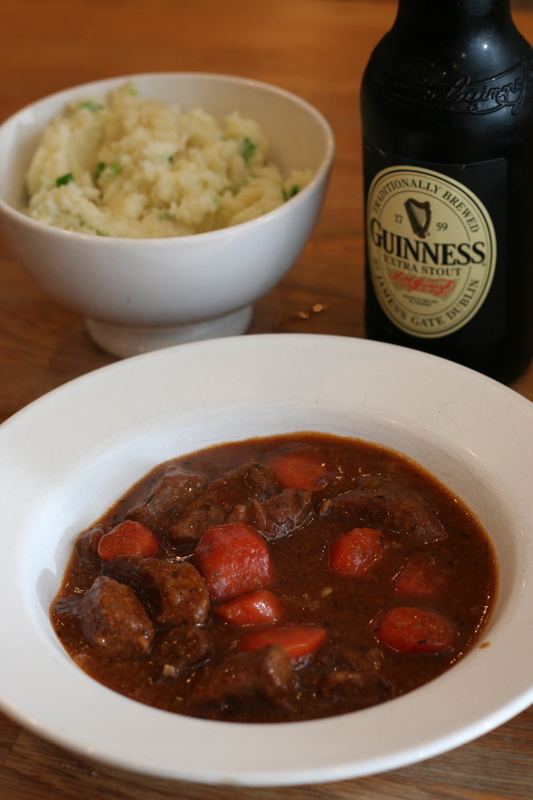 If you want to cook something special to celebrate St. Patrick’s Day on Wednesday, this beef and Guinness stew with a traditional Irish champ (brúitín) is just the thing. The stew is robust and full of flavor, given the pint of plain that’s in it. The bite of the spring onions in the champ is the perfect accompaniment to the rich stew, but feel free to serve it with plain mashed potatoes instead. If you want to round this off with an Irish dessert, try these easy Baileys cream pots. But don’t limit yourself to only serving this stew on Paddy’s Day. It’s actually the best beef stew I’ve ever made. To make this into a one‐pot meal, add some baby potatoes right into the stew along with the beef stock, Guinness and herbs instead of serving with the champ. And don’t be tempted to skip tossing the beef in the flour — the flour helps give the sauce its gorgeous, thick consistency later on. Like most stews, this one actually improves in flavor after a day, so the leftovers are even better. Pat the beef dry. Stir together the flour, salt and pepper in a bowl. Add the beef, turning to coat all the pieces, then shake off the excess flour and transfer to a plate. Heat the oil in a pot over a moderately high heat, until just smoking, then brown the beef in 3 batches, turning occasionally, about 5 minutes per batch (don’t crowd the pot, otherwise the beef will steam, not brown). Transfer to a bowl and set aside. Reduce the heat to medium. Add the onions and carrots to the pot and saute for 10 minutes, scraping up any brown bits from the bottom of the pan and stirring frequently. Add the garlic and cook for 1 minute. Add the tomato paste, stir to coat the vegetables, and cook for 1 minute more. Stir in the beef along with any juices accumulated in the bowl. Add in the beef stock, Guinness, Worcestershire sauce, thyme and bay leaves. Stir to combine. Bring the stew to a boil, then reduce the heat to medium‐low. Simmer, uncovered, for 1 to 1 1/2 hours, stirring occasionally, until the beef is fork‐tender and the sauce has reduced and thickened. To serve, spoon off any fat that may have risen to the top of the stew. Taste for seasoning. Spoon some champ into individual shallow bowls or plates, making a well in the center. Ladle the stew on top of the champ, garnish with the chopped parsley and serve. If you have your own favorite recipe for mashed potatoes, just follow that and add the scallions at the end, and voilà! Now you have champ. Or you could try making colcannon, another traditional Irish potato dish and first cousin to champ. Peel the potatoes and slice them 1/4 inch thick. Put them in a large pot of generously salted water and bring to the boil. Simmer until the potatoes are tender, then drain. Return the potatoes to the pot off the heat, cover with a clean tea towel and allow to sit for 5 minutes (this helps to dry out the potatoes, resulting in a fluffier mash). Meanwhile, while the potatoes are cooking, place the milk, butter and spring onions in a saucepan over a medium heat, until the butter has melted. Mash the potatoes, then pour in the hot milk and spring onion mixture and beat with a wooden spoon until the mash is fluffy and light. Taste for seasoning and serve piping hot.